(October 2015) Cold Brook Path officially opens for four season non-motorized use, in Marshfield. It's the trail that goes through the old town sandpit (but "Cold Brook Path" is a nicer name). This has long been a VAST snowmobile trail which people have informally used year round. Now the summer time and non-motorized trail users are getting a chance to step up and do their part to help take care of the trail. Thanks to private landowners and the Town of Marshfield, four season non-motorized use is being formally allowed in addition to snowmobiles. CVTA is signed up to help maintain the trail so that it will work as well in summer as it already does in winter. 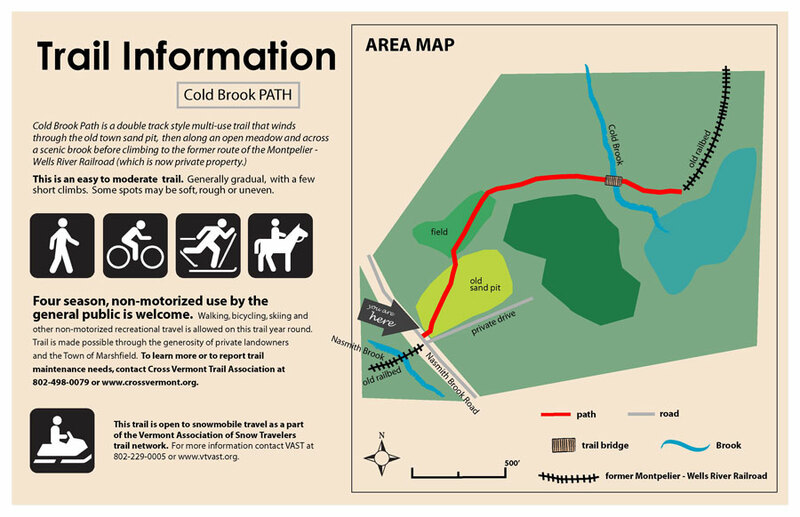 The Cold Brook Path is about a third of a mile long and provides access to a scenic area along (you guessed it) Cold Brook. The trailhead is on Nasmith Brook Road, up the hill from Twinfield School. 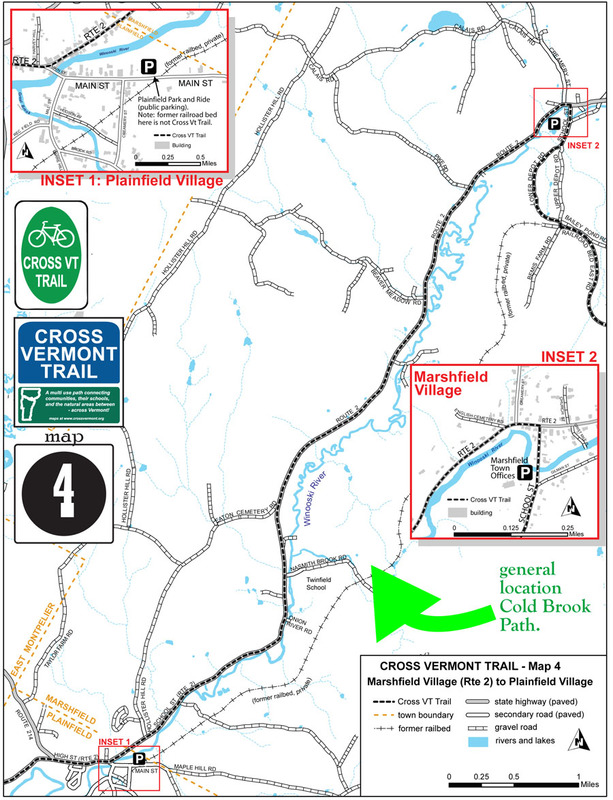 Did you know that the goal of CVTA is to make an official, off road trail that connects all the way across Marshfield, but that we haven't yet? The old railbed is not a trail. The old railbed in Marshfield between the Plainfield park and ride and Depot Street up the hill from Marshfield village is not a public trail (except for a VAST trail in some places). It's not the Cross Vermont Trail and never has been. So, we've got some work to do to reach our goal. Are you interested in the possibility of a real trail that is responsibly maintained and works great? On or off the railbed - wherever makes the most sense? So are we - we'd like to talk more! Give a call anytime.